We offer the Hair Tissue Mineral Analysis (Profile 1) test and basic report (previously available only through doctors) for only $87. This is the most affordable and accurate hair analysis available. The multi-element assay of hair (38 elements) is performed by a federally licensed clinical laboratory called Trace Elements, Inc., who have been in business since 1984. (Please note that Trace Elements is a separate company from us, Evenbetternow, LLC). Trace Elements do not sell the hair analysis test to the public directly. The hair sample is prepared through a series of chemical and high temperature digestive procedures. Testing is then performed using highly sophisticated detection equipment and methods to achieve the most accurate and precise results. Copy of test results showing a computerized bar graph illustration of high, low and reference range levels of the 38 elements listed below under Elemental Assay of Minerals Tested. Includes reference range to high levels for 8 toxic heavy metals. Low, high and reference range for 15 important nutritional elements. Low, acceptable and high levels of 6 significant mineral ratios. Low and acceptable ranges for 9 mineral to toxic metal ratios. Calculated values for 11 additional ratios. Brief explanation of the importance of each graph. Unlike some labs that test for hair minerals, Trace Elements, Inc. does not wash the hair at the lab. Washing the hair removes some of the loosely bound minerals and can reduce some mineral readings by 50% or more. 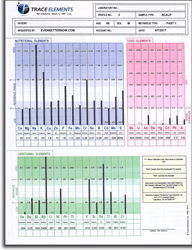 The Profile 1 Hair Analysis is ideal for those individuals who are wanting to measure the levels of toxic metals and mineral ratios in their hair tissue as a way to monitor their nutritional status, chart their detoxification progress, and get a detailed blueprint of their nutritional metabolic activity. Please note that the hair tissue mineral analysis test is for informational and educational purposes only! View Sample Report: To view a sample report illustrating the bar graph results for the elements tested, please click here. Why do a Hair Tissue Mineral Analysis Test? Analysis of hair tissue is a non-invasive method (unlike the chelation challenge test) for determining which toxic heavy metals are present in the body. In addition, it can also measure the levels of essential minerals in the body, such as calcium, magnesium and zinc, as well as important mineral ratios. Too little or too much of any of these essential minerals can have an adverse effect on the human body and its ability to recover. Hair analysis testing is worth doing because a surprising number of people diagnosed with chronic health conditions actually turn out to have a heavy metal problem or mineral deficiencies. Heavy metal problems can be corrected using a safe detoxification program. A hair analysis allows the underlying problem to be identified and with proper dietary changes, supplementation and detoxification, the chronic health condition often improves. For more general information on the benefits of hair analysis testing, click here. 8 Toxic Heavy Metal Elements: Antimony, uranium, arsenic, beryllium, mercury, cadmium, lead and aluminum. These heavy metals are well-known for their interference upon normal biochemical function and causing numerous imbalances in the body. 15 Essential Minerals: Calcium, magnesium, sodium, potassium, copper, zinc, phosphorus, iron, manganese, chromium, selenium, boron, cobalt, molybdenum, and sulfur. These nutrients play significant roles in such metabolic processes such as muscular activity, endocrine function, reproduction, skeletal integrity, and overall development. Also includes 15 Additional Elements including: Germanium, barium, bismuth, rubidium, lithium, nickel, platinum, thallium, vanadium, strontium, tin, titanium, tungsten and zirconium. All mineral/metal levels are reported in milligrams percent (milligrams per one-hundred grams of hair). One milligram percent (mg%) is equal to ten parts per million (ppm). 6 Significant Mineral Ratios: Ca/P, Na/K, Ca/K, Zn/Cu, Na/Mg, Ca/Mg, Fe/Cu. If the relationship between certain minerals in the body is disturbed, normal biological functions and metabolic activity can be adversely affected. 9 Toxic Mineral/Metal Ratios: Ca/Pb, Fe/Pb, Fe/Hg, Se/Hg, Zn/Cd, An/Hg, S/Hg, S/Cd, S/Pb. Individuals with elevated toxic levels may not always exhibit clinical symptoms associated with those particular toxic minerals. However, research has shown that toxic minerals/metals can also produce an antagonistic effect on various essential minerals, leading to disturbances in their metabolic utilization. A calculated comparison of two elements to each other is called a ratio. To calculate a ratio value, the first mineral level is divided by the second mineral level. Reference Ranges: Generally speaking, the reference ranges in the report should be considered as guidelines for comparison with the reported test values. These reference ranges have been statistically established from studying an international population of "healthy individuals". The reference ranges should not be considered as absolute limits for determining deficiency, toxicity or acceptance. Please Note: The basic Profile 1 HTMA does not come with a detailed written analysis of the results. However, if you would like a personalized review and consultation (by phone) to help you understand what your results mean, we can refer you to a third-party professional. We have partnered with nutritional therapy practitioner Rainbow Lopez, M.A., N.T.P. who was personally trained by Dr. Rick Malter (author of "The Strands of Health" book) in the complexities of interpreting the hair tissue mineral analysis by Trace Elements, Inc.
Rainbow will go over in detail the results of your test and explain how the levels measured relate to your metabolic rate, stress and energy levels. She will make further recommendations on diet and supplementation that is specific to your needs for improving your mineral balancing and any nutritional deficiencies. For more details about her Hair Analysis Review and Intrepration of Results service, please click here. What are the steps to receiving my report? Once you place an order for the hair analysis with us, we send you the hair sample kit with complete instructions on how to take the hair sample. The kit is mailed in a USPS Priority Mail envelope (within USA only). The kit includes a lab submittal form with envelope for hair sample, cardboard scale to ensure enough hair is collected (about 1 heaping teaspoon), and complete instructions on how to take the hair sample. If you would like to view the instructions in advance, please click here. You then send the hair sample and submittal form to the lab (in the pre-addressed envelope), and the lab sends us the electronic email copy which you will receive first followed by the printed bound report shipped to you via USPS First Class Mail. (Reports for international customers are mailed via First Class Mail International). Please Note: In most cases, the turnaround time to receive your hair analysis results from the time you place the order with us is 2-4 weeks. Also Note: If you are ordering a hair analysis for anyone other than yourself, including in your own family, it is very important that you include their name, address and phone number in the "Additional Information" section of the shopping cart, so that we can match your order to their name and ship the report directly to them or to you if it is a family member. The price charged by health care professionals for this very same analysis is usually $100 and up. Our price for the basic Hair Tissue Analysis (Profile 1) by Trace Elements, Inc. is only $87.00 (includes printed and electronic copy of results). Receive 10% off when you purchase 2 or more Profile 1 kits! For individuals wanting a more comprehensive report that includes an interpretation of your results with respect to your metabolic type, as well as dietary and supplement recommendations we offer the Comprehensive Hair Analysis Report (Profile 2). Price includes mailing of the hair analysis submittal form/kit to you and the report from the lab once it is sent to us. "Our family (nine children) has found many helpful things on your site. The most significant is your Comprehensive Hair Analysis. We have begun using it on the most serious health issues in our family and have found it to be very useful in getting to the root of our health problems. No significant toxic levels of heavy metals have been found, but the hair analysis is a life saver in addressing some of the emotional health issues we have. Thank you!" Helpful Link: For Frequently Asked Questions about the Hair Tissue Analysis, please click here. Alert To New York State Visitors: Due to current New York State regulations (NY Public Health Law Section 574), we are unable to process samples collected from residents of New York at this time. Therefore, we regret we cannot accept orders with a NY State billing or shipping address. Please call us at 520-877-2637 for more information on this. Argentina, Australia, Brazil, Chile, China, Croatia, Denmark, El Salvador, Ecuador, Finland, Guatemala, Honk Kong, India, Indonesia, Jamaica, Kuwait, Malaysia, Mexico, Netherlands, New Guinea, New Zealand, Norway, Poland, Singapore, South Africa, South Korea, Spain, Sweden, Switzerland, Taiwan, Thailand, and United Arab Emirates. Visitors from these countries need to purchase the test from a distributor in their region. Please contact Trace Elements, Inc. for further information. We also offer hair tissue mineral analysis for dogs (canine) and horses (horses).